Restaurant Pick of the Week is BACK! 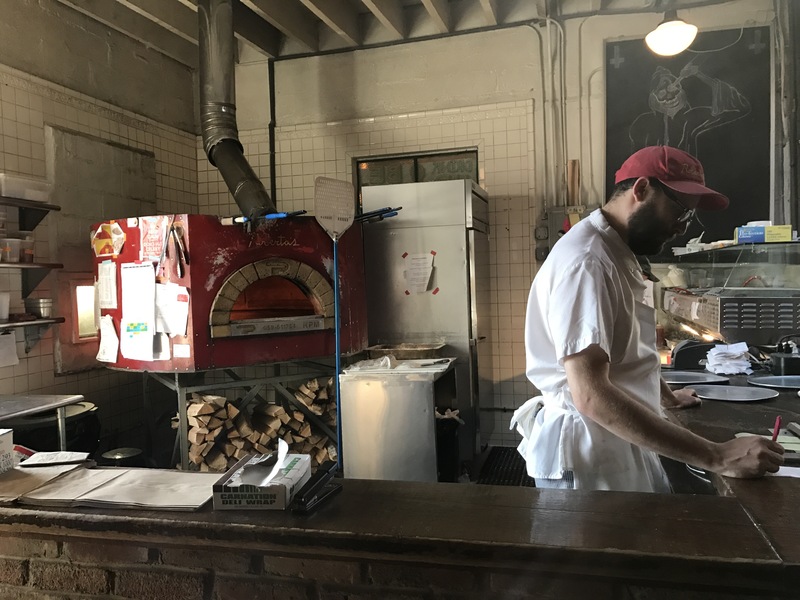 Roberta’s: this is how pizza should taste. 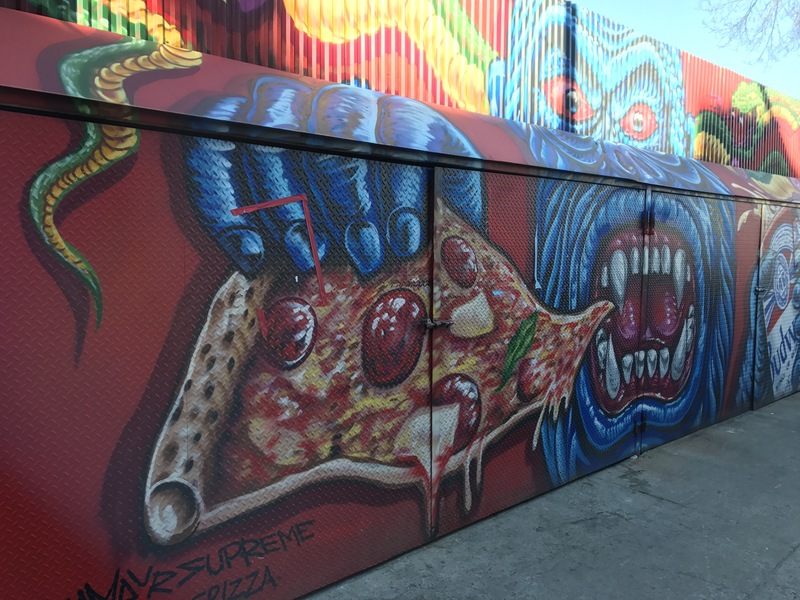 Seriously, there’s a reason that this hipster pizza haven has such a good reputation. It’s AWESOME. 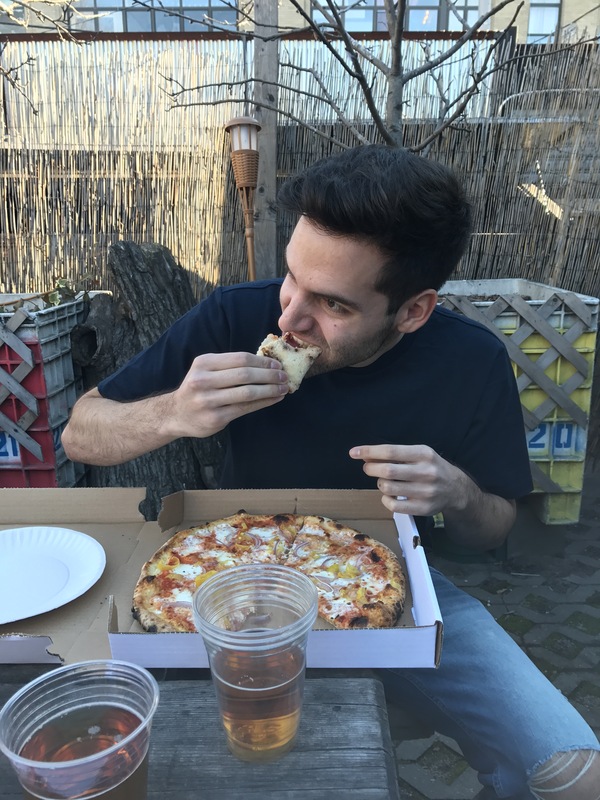 Ben and I have wanted to make the trip out to Bushwick for a while and the break from the bone-chilling cold this weekend gave us the perfect excuse to continue our unofficial NYC pizza eating tour. The main entrance to the restaurant is slightly bizarre. 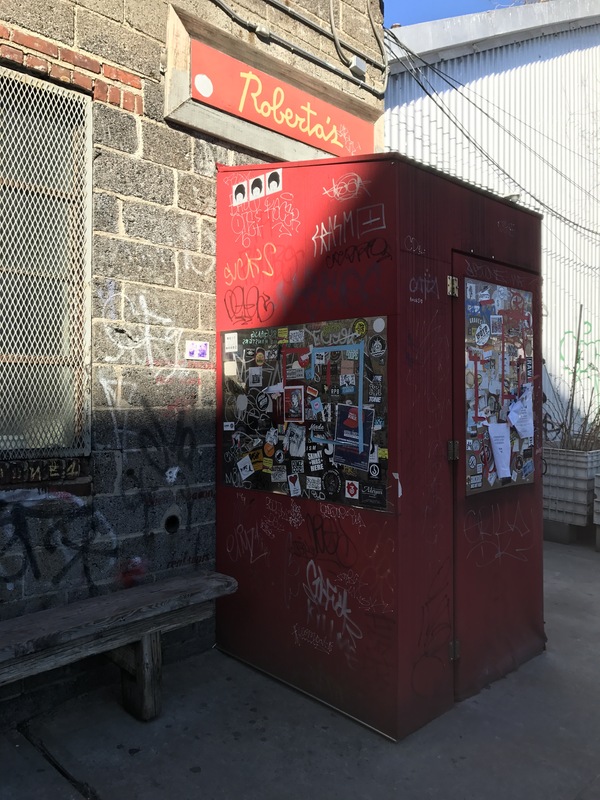 Behind the sticker and graffiti-covered entrance, one might expect to find a dingy dive bar. Wrong. Instead, you’d find an open space filled with community picnic tables and some odd and sporadic decorations. It has a grungy, yet hip feel to it. We actually didn’t sit inside, though, since it was so nice out. 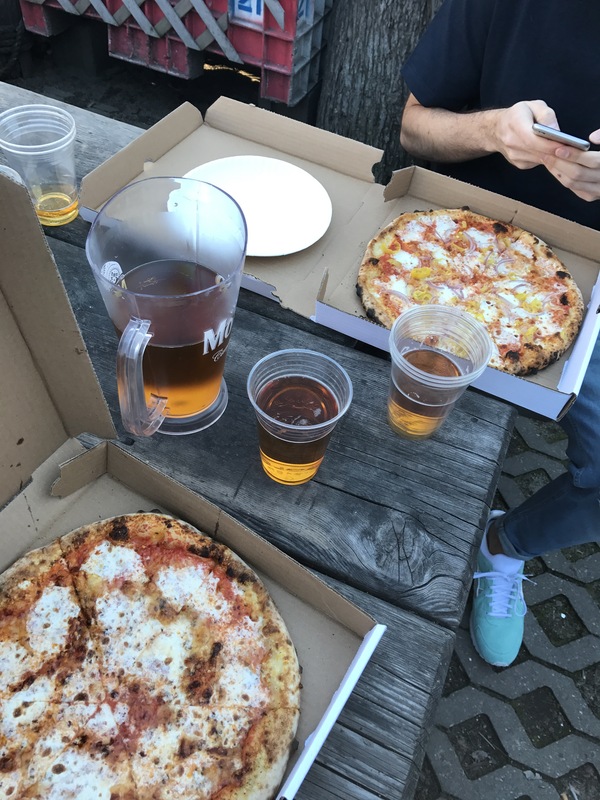 Following a wall of sick graffiti lead us to the AMAZING outdoor picnic area that was filled with people eating their precious slices of pizza, which they were washing down with pitchers of Modelo. 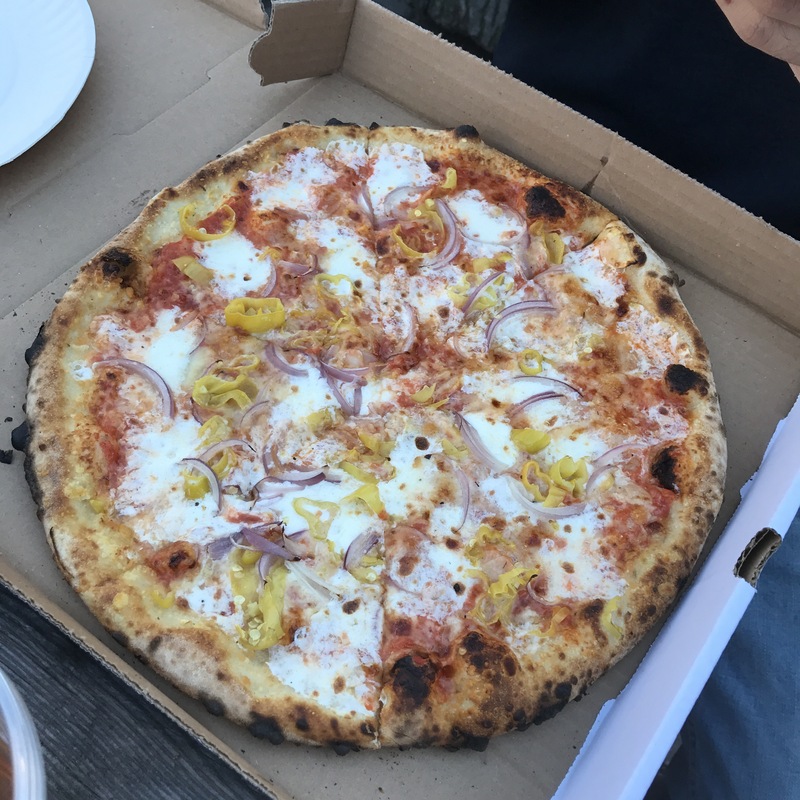 If you eat outside, you have to order the pizza next door at a separate pick up spot, so we put our orders in and wandered around the area for a little before heading back to the patio for a pitcher. 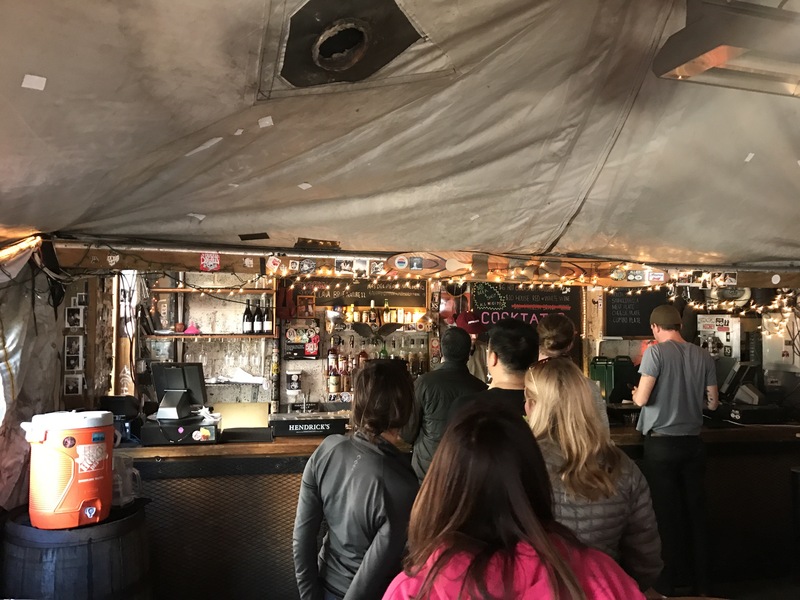 They have a big tent with a full-service bar and tables inside, which was pretty cool. After we got out pitcher, we had to post up for a while before actually snagging a seat (annoying!) It was pretty packed, but we got spots eventually. The perfect afternoon only got better once we added the pizza into the mix. I got the Famous Original and Ben got the Lil’ Stinker. They were both outrageously delicious. Both personal pies were actually pretty similar, except mine was a little spicy and Ben’s was slightly more flavorful. The Lil’ Stinker had double garlic, onion, and pepperoncini pepper, which made it really tastey. 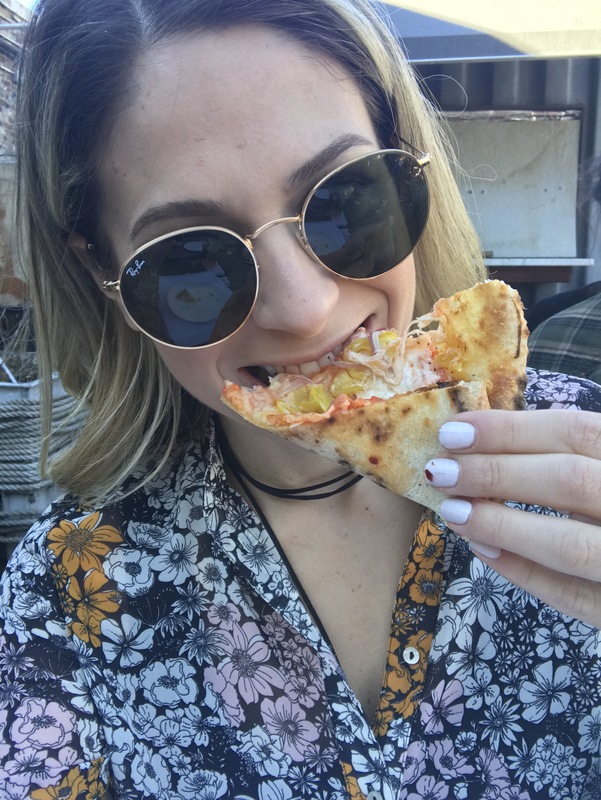 The Famous Original basically tasted like a cheesier Margherita pizza. While I like to explore when it comes to pizza, but this classic pie just felt right. I loved it! Neither of the pies was overly greasy, which made the slices manageable and the crust was cooked to perfection. 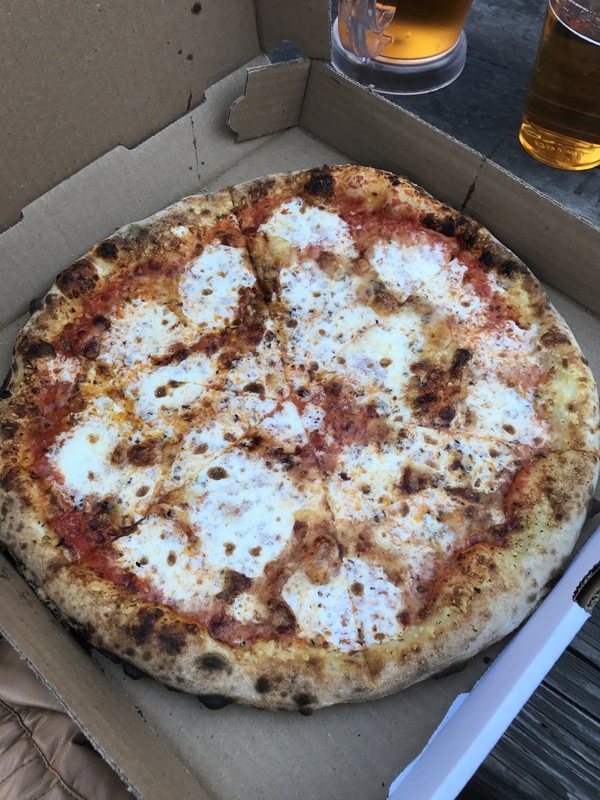 Roberta’s will be hard to beat in my book! But then again, we haven’t tried Lucali yet ;). 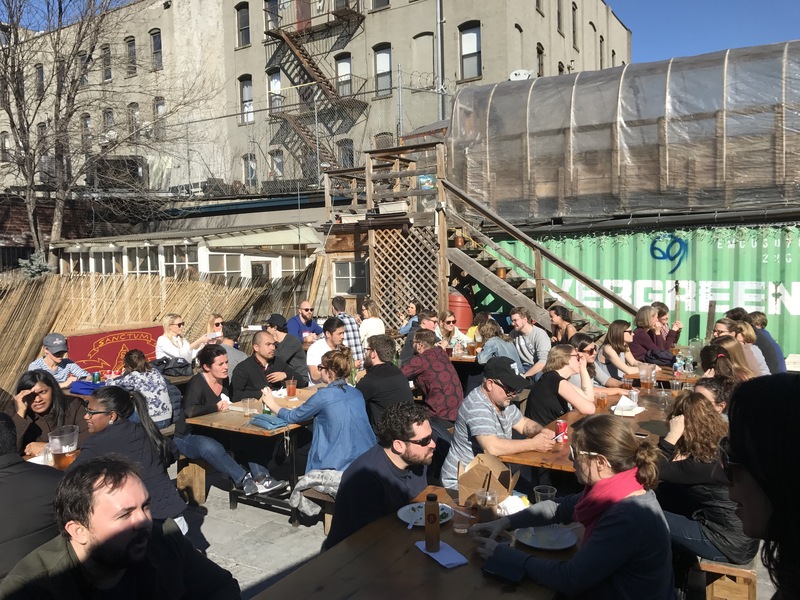 As the weather gets warmer, you should put indulging at Roberta’s high up on your to-do list! Don’t skimp and go to Urban Space. 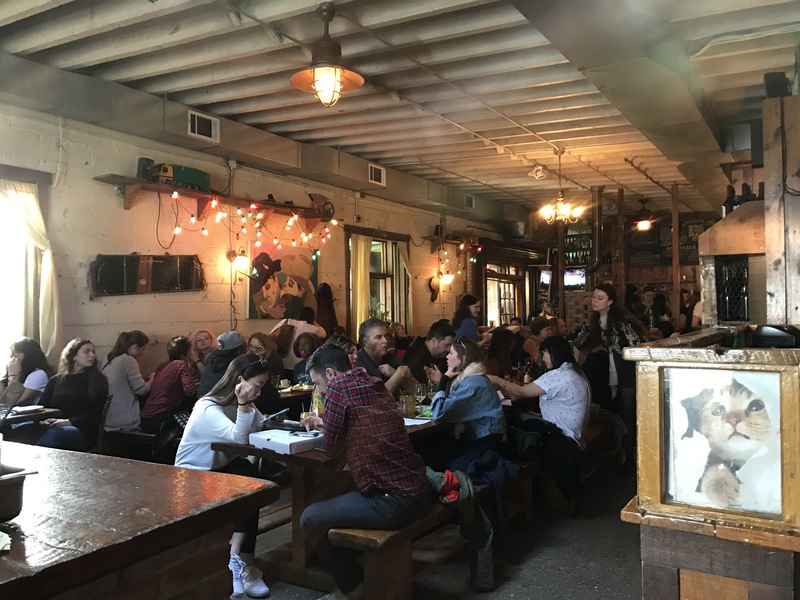 Take advantage of the sunshine and go to the REAL Roberta’s! You won’t regret it. 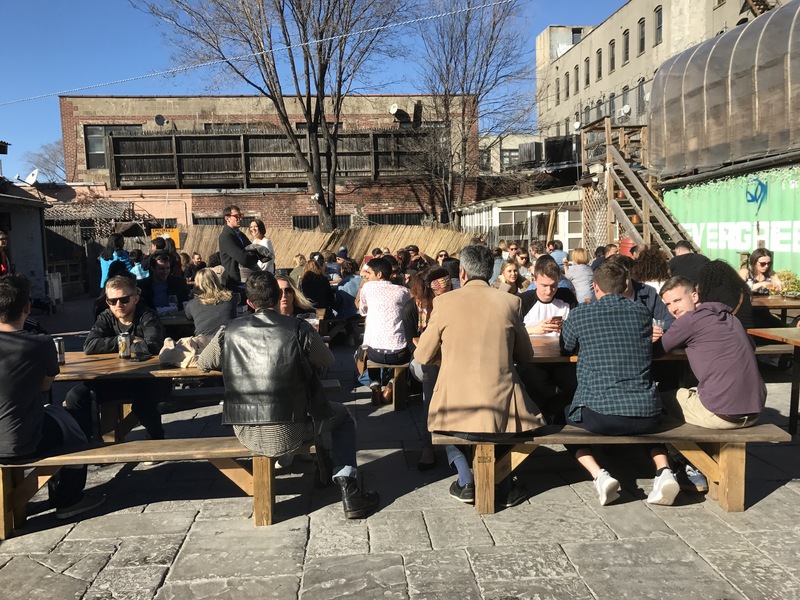 While I’d like to sit inside someday, I think the outside patio is definitely where it’s at during the summer months. From the pitchers to the rap music, it’s a really cool atmosphere. It’s also not that far! 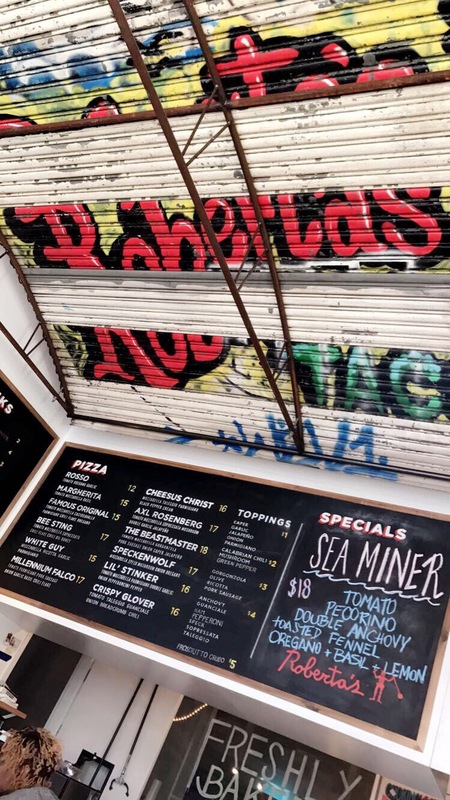 Roberta’s is just around the corner from the Morgan Ave stop on the L train. Plus, Morgan Ave is only 6 stops in on the L once you hit Brooklyn, so it’s a really easy trip from Manhattan (as long as you don’t head in the opposite direction on the L, which a certain someone may have done this weekend). I suggest heading out there early and making a day out of it. Aside from hitting Roberta’s, we spent a lot of time wandering around and looking at all of the incredible graffiti and wall murals. We even saw a graffiti walking tour in progress! Fear not, a picture with some of my favorite graffiti stops is coming soon! Oh my gosh yum, totally wish I lived there so I could try this! It looks amazing!! It was SO GOOD! It should definitely be on your list if you’re ever in the area!